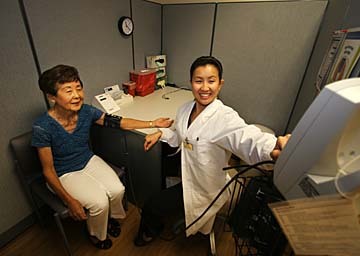 Machiko Tsuruya, 74, got her blood pressure checked Wednesday during a physical by medical assistant Lisa Lam at HMSA's HealthPass office in the Central Pacific Bank building on the corner of 10th and Waialae avenues in Kaimuki. Tsuruya has been getting her HealthPass checkup since 1995, and the program helped persuade her to finally quit smoking after a 50-year habit. After 50 years of smoking, Machiko Tsuruya, 74, says free HealthPass screenings offered annually to Hawaii Medical Service Association members persuaded her to quit. "This past year, I thought I was being such a hypocrite -- the best thing I can do to help myself is quit smoking," so she quit last Oct. 26, she said. The Hawaii Kai woman is one of about 20,000 to 25,000 HMSA members who take advantage of the free annual HealthPass Program, located on the fourth floor of Central Pacific Bank, 10th and Waialae avenues, in Kaimuki. The program began in 1990 as a disease prevention and health promotion effort, helping HMSA members to improve their lifestyle and health practices. "It's a quick and immediate-result kind of place," Tsuruya said. "I like the fact that you can sit there and in 20 minutes they can give you all the results about cholesterol and blood stuff ... and I like the people. They're very nice over there." A four-year study by HealthMedia Inc., a Michigan-based health assessment firm, evaluated cost claims of 380,000 HMSA members -- HealthPass and non-HealthPass participants -- from 2002 to 2005 and the impact on health and health risk. "HealthPass participants were found to incur consistently lower inpatient, outpatient, medical and pharmacy claims," the report said. HealthMedia was founded by Victor J. Strecher, University of Michigan Department of Health Behavior and Health Education professor and associate director of the university's Comprehensive Cancer Center. » Significantly lower total health care costs. Lower costs were associated with number of years of participation. » An average of fewer claims and fewer hospital days. » A lower percentage of inpatient and outpatient claims. » Estimated savings in health care costs for participants in 2005 was $6.8 million. Source: HealthMedia Inc., behavior science and consulting firm, Ann Arbor, Mich. He led the research and went through the HealthPass program himself last year. "I love the program. It was really fun to take," he said in a telephone interview. The long online questionnaire "is a full meal," he acknowledged. But the questions provide important information for counselors, he said, adding that a "shorter, smarter" version is being developed. Strecher learned he could work on reducing his body mass index of 26, which ideally should be between 20 and 25, he said. "I'm about 10 pounds overweight," said the 6-foot-2-1/2-inch, 205-pound researcher. Strecher said considerable time was spent training the counselors and the addition of counseling to the online program "is a great therapeutic endeavor" that is rare in similar health screening programs nationally. "One thing I just love about working with HMSA, they really, truly care about their members," he said, calling the state's largest health insurance carrier "a model for the rest of the country on how health promotion and disease promotion should be done." He said it's an investment in members "that has paid off for HMSA big time." Looking at lifestyle changes of HealthPass visitors, HealthMedia estimated a cost savings of more than $500 per participant in the year after a first-time visit to the program. HealthPass was recognized with the prestigious C. Everett Koop National Health Award for 2002 for improving the health of its members and reducing medical costs. Caryn Ireland, who heads the HealthPass program, "should really be commended," Strecher said. "She puts members before everything else." Ireland said 52,000 members went through HealthPass in the four years of the study. The counselors also go to about 100 employers every year and provide services, she said. She said the average age of an HMSA member going to the center is 52; at the work site, it's 43. "We're capturing the younger population -- certainly the one to talk to about behavior change and risk factors." HealthPass isn't a substitute for a personal physician but an added benefit, Ireland said, pointing out doctors often can't spend the kind of time the counselors do discussing physical activity, nutrition, stress management and weight management. HealthPass screening takes from 45 minutes to an hour and is offered at seven locations statewide and at work sites. For more information, call 948-6456 on Oahu or (800) 525-6548 on the neighbor islands.